Our modular fencing systems are specifically designed to withstand Australia’s unique conditions, and are a perfect choice for Brisbane’s tropical climate and coastal lifestyle. With certain wall styles rated for up to Wind Region C, and aluminium post options for rust-resistant coastal applications, Brisbane’s unique considerations have been designed into the very structure of our products. Our fences perfectly harmonise with modern, coastal-style Queensland homes, with premium aesthetics that mirror a rendered brick wall, for half the cost and a quarter of the install time. Our systems are DIY-friendly, or you can take advantage of our nationwide network of Trade Partners, who can expertly quote and install the fence for you. With the option to integrate retaining panels for sloping blocks, or elements such as lighting, letterboxes, slats and infills, never before has one fence held so much potential. Amongst shrinking lot sizes and urban sprawl constantly pushing residential zones closer to major arterial roads and commercial/industrial areas, we’re seeing a dramatic increase in people needing acoustic protection from their fence. Delivering an average 20dB – 25dB noise reduction, ModularWalls’ fencing and wall systems will help block out traffic and neighbourhood noise, whilst also protecting your home’s privacy and security. 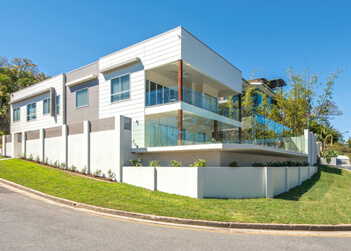 Whether you’re after privacy, noise reduction, premium aesthetics or ease of installation, ModularWalls’ fencing and wall systems are designed specifically for the urban demands and geographical conditions of Brisbane homes. From Apsley, to Rocklea, to Carindale, our range of wall and fencing products can be supplied as a DIY kit or expertly installed by our qualified Trade Partners. Our Head Office is open 8.00am to 4.30pm (Sydney time), where our friendly staff are always happy to discuss your specific project needs and advise you on anything from material choices, to popular designs, to installation support. Our Trade Partner network extends to a number of the larger regional cities. We also supply materials to the furthest reaches of Queensland, and our systems can easily be installed DIY or by any local fencer, landscaper or builder. Give our team a ring on 1300 556 957 or enquire online to find out how we can best provide the perfect solution for your project, no matter where you call home. 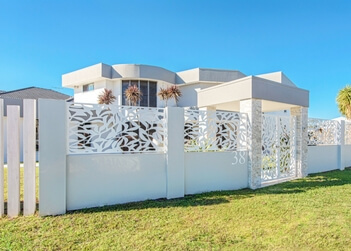 This phenomenal home on the outskirts of Brisbane incorporated laser cut decorative screens within the EstateWall for the grand architectural design of their front wall. Welcome to the ultimate game-changer for sloping blocks; integrate retaining panels into your boundary fence for a single, seamless wall solution. A residential development required a vast number of retaining walls, whilst keeping aesthetics, budget, timeline and enviro-friendly practices at the forefront. Get Started on your Brisbane project today! Our wall systems are specifically designed to withstand Australia’s harsh conditions, and are perfectly suited for Brisbane’s tropical climate and coastal lifestyle. With certain wall styles rated for up to Wind Region C, and aluminium post options for rust-susceptible coastal applications, Brisbane’s unique considerations have been designed into the very structure of our products. From pre-approved MRTS-15 compliant road noise barriers, to wall and fencing solutions for community developments, to revolutionary sound absorbing panels, our noise attenuation products are designed for the heightened demands of modern noise pollution challenges. 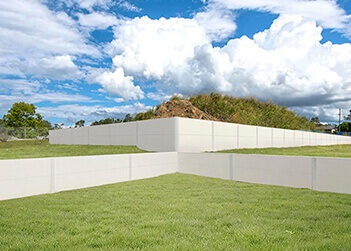 Our commercial retaining panels also seamlessly integrate within larger boundary or noise barrier systems, offering a simplified, combined wall solution. With the option to further customise with integrated lighting, letterboxes, slats, infills and more, never before has a single wall system offered so much potential. Compared with traditional concrete, our products deliver superior aesthetics and provide up to 80% reduction in embodied and emitted carbon project-wide, supporting carbon efficient construction practices. The modular composition of the systems ensure a rapid, simplified install process, whilst the lightweight materials overcome site specific challenges including restricted access or easements across public services. ModularWalls is here to support you at every stage of your project; from the initial design consultations, right through to installation support, we can offer tailored, turnkey solutions for your requirements. Our Australian Made products are locally manufactured at our Head Office in Kurnell, NSW, ensuring rapid supply and a unique control of the entire supply chain. From Apsley, to Rocklea, to Carindale, we have become a trusted market leader of acoustic wall and fencing solutions. Our QLD consultant, Troy Waddell, is a Brisbane local and more than happy to meet with you to discuss your specific project needs. We have completed projects in some of Australia’s most remote locations and harshest climates; give us a call on 1300 556 957 or enquire online to discuss how we can provide the best solution for your project. 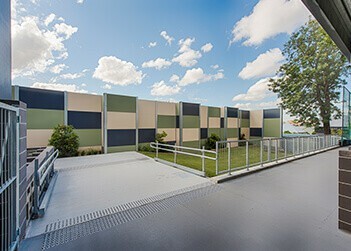 New Farm State School was quick to contact ModularWalls following neighbour complaints regarding the excessive noise emitted from their premises. A large-scale development saved money on a vast number of retaining walls, whilst keeping aesthetics, timeline and enviro-friendly practices at the forefront. 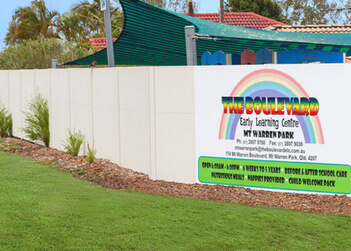 With changes in regulations, local councils were imposing strict acoustic guidelines on childcare centres; SlimWall acoustic fencing met all the criteria.